To illustrate the concepts behind object-oriented programming in R, we are going to consider a classic chance process (or chance experiment) of flipping a coin. In this chapter you will learn how to implement code in R that simulates tossing a coin one or more times. Think about a standard coin with two sides: heads and tails. Once you have an object that represents the coin, the next step involves learning how to simulate tossing the coin. 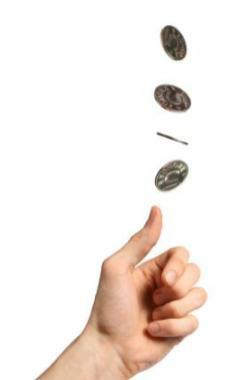 Tossing a coin is a random experiment: you either get heads or tails. 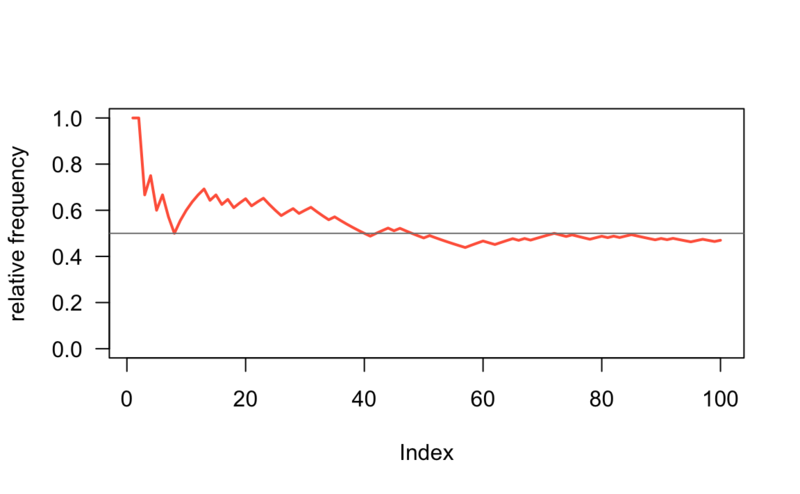 One way to simulate the action of tossing a coin in R is with the function sample() which lets you draw random samples, with or without replacement, of the elements of an input vector. You use the argument size = 1 to specify that you want to take a sample of size 1 from the input vector coin. By default, sample() takes a sample of the specified size without replacement. If size = 1, it does not really matter whether the sample is done with or without replacement. What if you try to toss the coin three or four times? Notice that R produced an error message. This is because the default behavior of sample() cannot draw more elements than the length of the input vector. #>  "tails" "tails" "tails" "tails"
The way sample() works is by taking a random sample from the input vector. This means that every time you invoke sample() you will likely get a different output. #>  "heads" "tails" "heads" "heads" "heads"
#>  "heads" "tails" "heads" "tails" "tails"
In order to make the examples replicable (so you can get the same output as mine), you need to specify what is called a random seed. This is done with the function set.seed(). By setting a seed, every time you use one of the random generator functions, like sample(), you will get the same values. #>  "heads" "tails" "heads" "heads"
Last but not least, sample() comes with the argument prob which allows you to provide specific probabilities for each element in the input vector. #>  "heads" "tails" "tails" "tails" "tails"
In my case, I got 56 heads and 44 tails. Your results will probably be different than mine. Sometimes you will get more "heads", sometimes you will get more "tails", and sometimes you will get exactly 50 "heads" and 50 "tails". To make things more interesting, let’s consider how the frequency of heads evolves over a series of n tosses (in this case n = num_flips).